Our latest round-up from local football circles includes victories for Bosham in division two of the Southern Combination and Bognor-based Unicorn United in the Horsham and Worthing Sunday League. Alex Barnes and James Wilson nabbed the goals to help Bosham seal an important win at Montpellier Villa on a very satisfactory day for the Reds. Bosham needed to react after last week’s loss to Roffey and a strong side took to the pitch on a cold afternoon in Brighton. The hosts made the better start and James Samways looked sharp while the skills of Aaron Blackburn were causing nerves – but keeper Josh Harris was in fine form between the sticks, dominating his box. Charlie Weller hit the bar as Villa went close to breaking the deadlock but the woodwork saved Bosham. Bosham started to settle and the dangerous Barnes was an increasing terror on the attack. Wilson marshalled the midfield with his usual presence and an exquisite through ball almost brought a goal for the Robins – but Ben Bishop was a too exuberant and the chance was lost. The pressure told just after the half-hour as the visitors took a deserved lead. Raj King burst through a gap and faced up to keeper Lewis Palfrey. He saved the stinging shot but could only parry it straight into the path of Barnes. who slammed the rebound home. King had a near-miss right on half-time but a narrow lead at the break was welcome for the management. And it didn’t take long after the restart for Bosham to grab a two-goal lead through the impressive Wilson. Barnes was the instigator and Palfrey could only parry a shot into the path of Wilson who sidefooted into the empty net to give the Reds breathing space. Bosham continued to create chances but the quality in the final third dried up. Bishop intercepted a poor clearance from the back but shot straight at Palfrey, who saved well. Alex Jarrom impressed for Bosham, the youngster showing good pace and an excellent eye for a pinpoint pass and went close late on only for his effort to go just wide. Bosham were left to celebrate a good win that keeps the momentum going ahead of this Saturday’s trip to Rottingdean. Bosham: Harris, Bulbeck, Briance, Buxton, Reynolds, SHurst, Barnes, Wilson, King, Bishop, Jarrom. Subs: Rustell, Spicer. Unicorn bounced back from their first defeat in 38 league games by beating Horsham and Worthing Sunday table-toppers Goring Galaxy. The Bognor-based team have now leapfrogged their rivals to go now three points clear with two games in hand and just five to play in their first season in the new division. Unicorn, who have yet to play bottom club AFC Beavers twice, had lost 5-3 to Angmering the previous week but hit back in style. They were always in control playing a new-look 3-5-2 formation and Harry Abrahams shone after the break despite missing a penalty in an even first half. 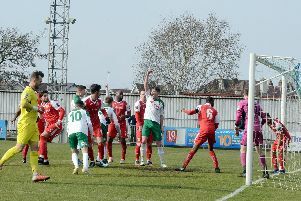 Joseph Matthews broke the deadlock with a stunning free-kick and Abrahams was brought down for another spot-kick which was converted by skipper Danny Miller.